I skipped work in the morning to shoot this. I knew the colors at the Portland Japanese Gardens would be on fire. I love the pool at the base of the falls because of the wirlpool effect it likes to give. Providing the exposure is long enough. I used a Circular Polarizer along with a 3 Stop Neutral Density filter stacked to get the exposure to 30 seconds. A bit risky due to the wind that was blowing that morning. But I caught a window where it died long enough to catch a few shots. I did not do too much in post. I applied a contrast mask to bring out the shadows on top, then did a levels adjustment layer to get my black and white points set. I applied a curves adjustment layer to correct the color cast. Then I applied a Brightness Contrast layer to help the overall contrast and to bring out the color just a little more. I hope you enjoy it.. Thank you all for the support! I cannot believe another ribbon. Here is the unedited file for you to compare. This image is amazing. I am sure thats been said already but I have to commend you on a wonderful capture. It's captivating. Congratulations on your ribbon! This photo is a marvelous example of stellar photography! Well done! BRILLIANT SHOT AND VERY WELL EXECUTED. the thunbnail doesn't do it justice. This is amazing... So beautiful. Congratulations. Thanks very much for posting your originals. It really helps the rest of us learn. Congratulations on a well deserved ribbon! Excellent shot! Whoa, this is pretty amazing! Congrats on the ribbon! super - congrats. curious why the crop. I cropped it because of the distracting reflection of the sky at the very bottom. But aren't those swirling fish? Great idea to feature them by going with a very long exposure, "longer than normal". With a typical 1 second exposure I always found them a distracting blur. The swirl is not the fish. It is a lot of fallen leaves that got trapped in the current. The exposure was set for 30 seconds. I accomplished the exposure by stacking a circular polarizer with a 3 stop neutral density filter and shooting at f14 at ISO 100. The shot was taken at about 9:30 in the morning. Congratulations on your Ribbon!! Awesome Shot!! You rock Justin! Congrats on a well deserved ribbon! Great shot + idea. One of the best shots I have seen here on dpc. I absolutely love the colours, the movement, the warmth, the joy and serenity of this shot. Great idea. Well conceived and shot - very poetic. There is really no words to say, I want someday to be able to have my pictures jump out and speak to others like this did to me. Second, second ribbon, second challenge, way to go! Phew -- I don't have to eat my own foot per my previous message! This is an awesome shot. Glad to see it with a ribbon on it! I didn't realize there was anything like this at the gardens. I've only been there once, but I was disappointed with the place and haven't been back. It certainly looks a lot different in your photo. It's a very dynamic image. Well done! Two reds in a row. Not a bad start! Excellent capture. I had seen a similar shot you had in your portfolio, and I think I like this one better. Congratulations on your ribbon. WoW!! this is amazing. Congrats! Great shot. Very original. Congrats on your Red. Didn't vote in this challenge, but man, this is brilliant. Congratulations. Such a great shot. well deserved ribbon! Well this was the "Long Exposure II" Challenge and not the "Wind" Challenge. Sorry if your upset that the voters voted correctly and you are the one who missunderstood. Sorry if I took a bit of shine off your ribbon... but are the voters actually thinking? The challenge was wind. You submitted a water shot... Maybe I just don't get it. man this is good. really really good. That's such an unusual image. Congrats! Simply mind boggling! Like a visual roller coaster. Congratulations on your RED. 2/2! Smoking hot! Congrats on REd. wow, obviously not beginers luck huh? this is amazing. and not that much editing. simply beautiful. congrats! Stunning shot. Congratulations on the red. 2 ribbons in 2 entries..
2 ribbons in 2 entries.. Way to go! Stunning, but a bit dizzying. Congrats on winning the red ribbon! I had a similar idea, but failed to make it work. This is gorgeous! Congratulations! Thank you for your votes everyone! I really appreciate it. I cannot believe I made the top 10 after I was done voting on all the strong images in this competition. Now if I could just do something other than a red. LOL!! Congratulations! Great image. I did two of these last month--I so wanted to do this for this challenge, but I didn't have a location to shoot with leaves (I took the others at the Ithaca GTG where there's no shortage of waterfalls). Nicely done! This is such an awesome shot! Congrats on your Red! okay, now get a blue or yellow or something. gave it a 10 btw. This is wonderful...when I first saw it I thought this is really nice and gave you an 8, but the more I have looked at it the more I like it, a real grower! you are now my number 10 for the challenge, my fav in the comp. well done. Great job turning a beautiful image into an amazing photo. Colors, framing, exposure, everything is great about this shot. 10. Very unusual and perfectly exposed. A 10. I hope this ribbons. Amazing photo. What a great photo except for one thing: It is slightly tilted. My this is just so surreal and beautiful! Great capture. Wow, interesting shot. Where does the current go?? Slow shutter certainly adds to the impact in this shot. Mind sharing how you did this?? Interesting concept. very trippy. 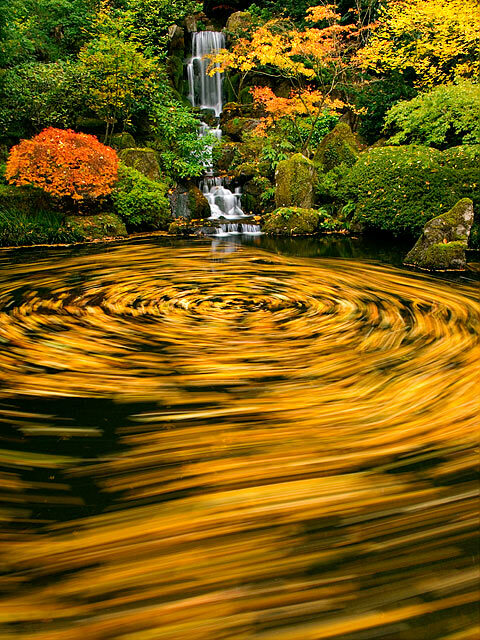 were the leaves floating in the water near a whirlpool or something? the background adds a nice contrast of stability to the swirl. 8. That is really cool. You did a great job on this. Nice one. I was going to do something similar, but in the UK the leaves haven't fallen yet. This is simply stunning. If this isn't a ribbon winner, I shall eat my own foot. What a capture! Great job with this photo. This is such a creative departure from the ordinary 'waterfall' images. Proudly hosted by Sargasso Networks. Current Server Time: 04/21/2019 05:06:30 AM EDT.